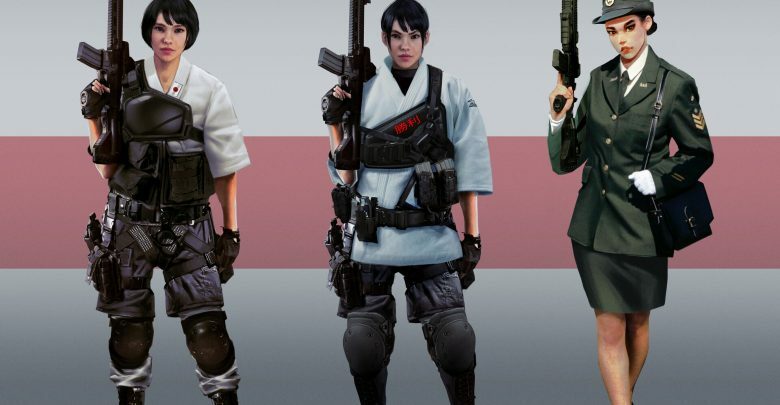 During the reveal of Rainbow Six Siege’s operation Burnt Horizon earlier this year, Ubisoft announced the Hibana ‘Onkochishin’ elite set. Paired with a rework of the operator’s face model, the premium cosmetic bundle for Hibana launched in February. Although the elite skin is definitely one of the better ones, some recently discovered concept art reveals a few of the eye-popping designs that didn’t make make the cut. The concept art of the Hibana elite set were uploaded by Arman Akopian, a Senior Concept Artist at Ubisoft. The research art drawings portray a handful of character models that could’ve ended up as the elite set. Some of the illustrations point towards a traditional Japanese style that many of us were expecting. The operator is portrayed wearing full sets of samurai armor, ninja apparel, and conventional Japanese outfits. Although none of these designs were selected, they most certainly influenced the elite set we now have. However, a lot of the designs seen in the concept art images look better than the elite skin we have now. The Hibana Onkochishin elite set is available now and can be purchased from the in-game store for 1600 R6 Credits, roughly $15. We can’t say for sure that these designs won’t ever make it into the game. Although Ubisoft hasn’t released more than one variation of the same elite skin, they might do so in the future. The recently released pro league sets for Clash, Kaid, Nomad, and Maverick marked the completion of the entire collection. While Ubisoft hasn’t officially announced more pro league sets, leaks suggest that the developer is planning a full revamp of the entire collection starting with Rook and Ash. For this reason, we might see the developers try something similar for the elite skins. However, there are still dozens of operators awaiting an elite skin, so don’t hold your breath.